I have this plan to put up a whole bunch of fermented foods before the baby comes. Miso and sauerkraut are fast food, but nutritious, and won't crowd my miniature fridge or freezer. So I ordered some spores for miso-making, and then threw in some tempeh spores out of curiosity. Although fermented, tempeh must be eaten fresh, or frozen for later--so it's not exactly part of my brilliant baby preparation plan. Just a nice moldy project for a foggy summer day. Also, I have Sandor Katz's phenomenal new fermentation tome, The Art of Fermentation, sitting on my desk. That is a book to make a person get up and tend some fungi, I'll tell you what. And I'm not just saying that because it's the first book in the history of the world to quote me. It's a wonder. More grimoire than cookbook. Tempeh is the perfect introduction to mold-culturing, I've decided. Unlike miso, which requires a separate koji culturing process before its months-long cure, tempeh provides 36-hour gratification. It's barely more difficult than yogurt. It's also delicious; a traditional fermented soy product with its own cheesy-nutty flavor, not trying to be meat or dairy or anything it's not. I followed Sandor's directions in tandem with the directions that came with my spores from GEM cultures. The most difficult part of making tempeh is hulling the beans. Sandor explains that the hulls are too tough for the mold hyphae to penetrate. He suggests putting them through a grain mill on a setting just coarse enough to crack the beans. The other method is to remove the hulls manually after soaking, by vigorously rubbing the beans between your hands. This turned out to be a tremendous pain, and I should've just gotten out the grain mill. Once you've cracked a pound of beans (2.5 cups before cracking), soak them in plenty of filtered water overnight or longer. The timing is easiest if you cook them in the afternoon or evening, so they can get through the first 12 hours of fermentation while you're asleep. Rinse the soaked beans in a colander, put them a large pot, and cover with water two inches above the level of the beans. Bring to a boil, watching closely. When they boil, turn the heat down and set a timer for 40 minutes. Skim off the hulls as they float to the surface. While they cook, prepare your fermenting dishes and incubation chamber. Choose glass or stainless steel pans--I used two glass bread pans and a pyrex casserole dish. They only need to be clean, not greased or anything. For my incubator, I put a 60-watt incandescent bulb on the end of an extension cord and ran it into the bottom of the oven. I placed a pie tin on the bottom shelf over the bulb to diffuse the heat a bit. You're aiming for 85 degrees. As the temperature came up, I tested various corners of the oven and adjusted the door, which I found needed to be cracked about 1/4 of an inch. Get the spores ready, too. I mixed 1 teaspoon of spore powder with 1 tablespoon rice flour and 1 tablespoon brewer's yeast. The amount of spore powder you need depends on where you got it from--follow the package directions. The beans will still be quite firm at the end of 40 minutes. Drain them in a colander, then spread them thinly on clean towels to cool and dry. You might turn a fan on them to hasten the drying process, as mine were cool long before they were dry. Put the dried, cooled beans in a large mixing bowl and sprinkle half the spore mixture over top. Stir it in thoroughly, then sprinkle on the rest and stir it in. You want a very even distribution of spores. Pack the beans into an even, inch-high layer on the bottom of your fermentation vessels and cover securely with tinfoil. Poke holes an inch apart all over the tinfoil, and put the trays in your incubator. Keep a close eye on the temperature in the incubator, so maintains a stable 85-90 degrees. Rotate the pans as necessary to avoid hotspots. After twelve hours or so, you'll start to see some good mold growth. Continue adjusting the temperature and rotating the pans as necessary. Watch out! Once the mold starts to get established, it will generate a heat of its own. It could easily overheat and cook itself to death. If you see the temperature start rising, remove your heat source and keep a close eye on the mold. The tempeh is done when it's covered with an even, spongey layer of mold that tightly binds the beans together. 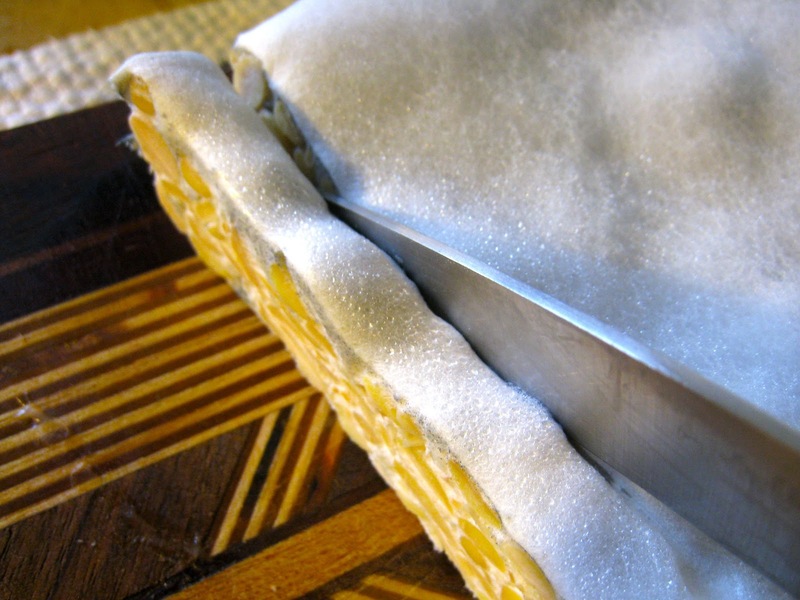 In fact, it will even contract and pull away from the sides of the pan. This pan of tempeh is perfectly done. You'll notice that the mold began to sporulate in the upper right. (The spores are gray-black.) I took a preggo nap towards the end of the fermentation time, and when I found this upon waking, I was a bit worried. My tempeh was perfect, however, and a little sporulation is a good sign that the tempeh is mature. Total fermentation time was 21 hours. 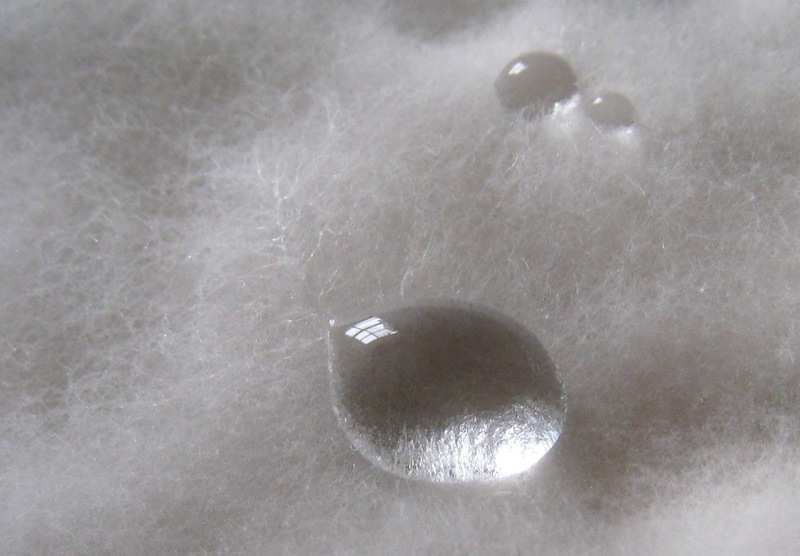 But look at the beads of condensation that fell onto the mold! 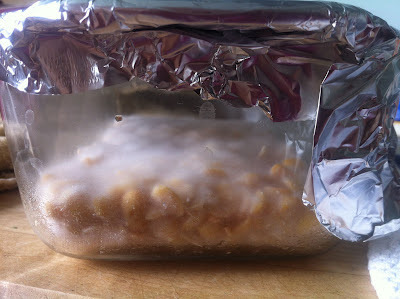 As soon as the tempeh is done, you need to halt fermentation as quickly as possible. Tempeh that you want to freeze needs to be wrapped and spread out in the freezer to chill as quickly as possible. 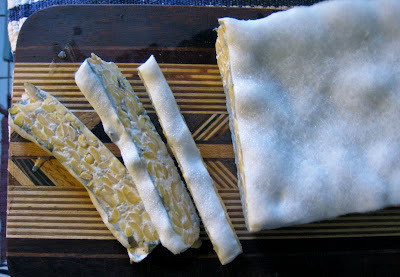 Tempeh for eating fresh should be refrigerated, also spread out. 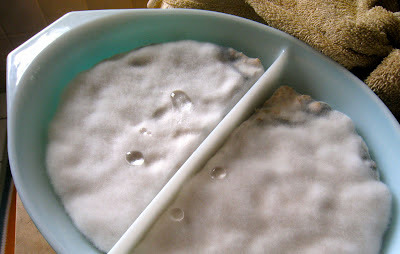 If it cools too slowly, the mold will continue to grow and sporulate. Store tempeh wrapped in plastic. It will keep for just a few days in the refrigerator. 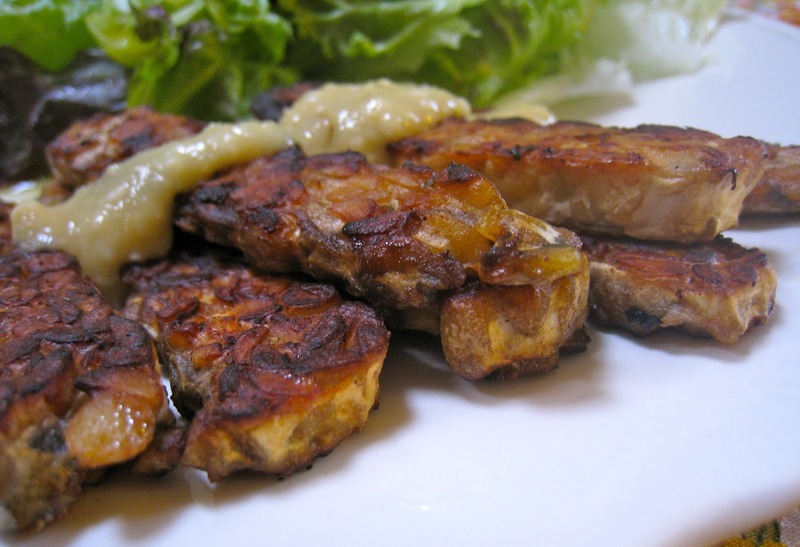 My favorite way to serve tempeh is to slice it and marinate it for a few minutes in some soy sauce. Then I gently fry it in butter until golden. You'll need to add more butter to the pan when you flip the tempeh slices, since they really sponge it up. I think it tastes like a grilled cheese sandwich. Last night I also dressed it with a miso-lime-garlic sauce, which meant that I was eating fermented-soy-marinated fermented soy beans with fermented soy. WHOA WHOA WHOA MISS LIPPY. The part of the story I don't understand is what happens at the end. When I buy that corporate Tempeh that grey fluffy mold bit on top is all gone. What about that? I guess they just trim it. You eating that stuff? You eat that little condensation bubble, too? Was that little bubble sweet and tasty? OK. I lichen this recipe very much. Probably they have such carefully controlled incubation conditions that the tempeh doesn't sporulate. They also don't fall asleep while making it. I should note, too, it looks way less dramatic once the tempeh is packaged. All the mold flattens and doesn't even look like mold. Sandor says that the different stage of sporulation all have different names and flavors in the traditional Indonesian preparations. Sporulated tempeh is definitely fine to eat, and once it's fried you can't even see the spores anymore. For example, the tempeh in the top picture was a little bit sporulated. The bubble was delicious. Like elf sweat. I've been making tempeh for a while and only the last couple of times have I noticed the condensation you describe. Do you do anything to try and dry it? @TehMorp--I didn't worry about them. Just thought they were pretty. roll up the beans in the bag and place on a clean towel on the floor. Now walk on the bag in bare feet and make all those beans rub each others hulls off. Make sure you cover all the area with your feet. Your body weight plus the close confinement of the beans in the bag will make them all contact each other just enough to rub off the hulls. All hulls gone in under a minute! Discovering this made my tempeh making really a pleasure instead of a tedious chore, and I much prefer whole beans to any others. Beautifully photographed and explained!!! Can't wait to add this to my ever-growing arsenal of fermented foods. Thank you, thank you, thank you!